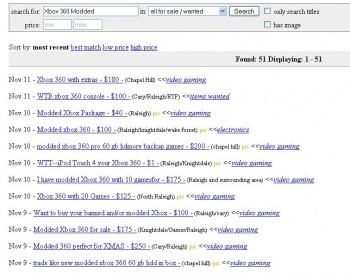 Buyer Beware: Illegally modded Xbox 360s have been listed as "for sale" on e-commerce site Craigslist in droves following Microsoft's mass banning of up to a million consoles from Xbox Live. Yesterday, we reported that Microsoft had banned anywhere from 600,000 to 1 million Xbox 360 units from accessing Xbox Live. The consoles in question had been illegally modified (or "chipped") to allow them to play pirated copies of games that had been burned to a disc. The heavy banhammer might not have caught all the pirates, but it made it so that quite a few of the bastards would have to purchase a brand-new 360 in order to play Modern Warfare 2 online. Wonder where all those modded 360s - still able to play games, just not online - ended up? On Craigslist apparently, reports CNET. The foiled pirates have put their consoles up for grabs, listing units - with some good games, too - for as cheap as $100. So, in the event that you haven't yet picked up a 360 and don't give a crap about anything on Xbox Live, there are probably some great deals there if you want to search through them. However, an official statement from Microsoft suggests that buyers should be extra-cautious, even if they know that the console they're buying is one of the banned, modded units - the warranty won't cover the new console should it come down with a bad case of the RRoD: "If you purchase a modified console second-hand, the warranty is not transferable and the purchaser assumes the risk for any previous modifications ... If you purchase a console that has been previously banned, you will not be able to connect to (Xbox) Live."